‘Hidden Lives:Leek’s Extraordinary Embroiderers’ is a new publication by Cathryn Walton. It reveals the lives of over 80 women who stitched exquisite embroidery for the Leek Embroidery Society. Lavishly illustrated with many colour images it features wives and daughters of wealthy silk manufacturers, solicitors and surgeons who together with daughters of Leek tradesmen were members of the renowned Leek Embroidery Society. Photographs of embroiderers, embroideries, people and places vie for attention on every page. Hidden Lives sheds light on the previously unknown women who stitched for Elizabeth Wardle. 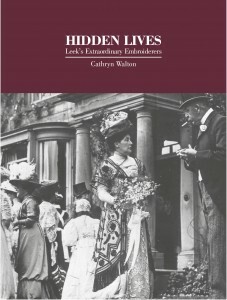 Hidden Lives: Leek’s Extraordinary Embroiderers now available. The Birmingham museum at Aston is getting together a group of ladies for historic embroidery.